Nestled away in Hampstead, just off Highway 210 West, spans 11 acres of breathtaking beauty. If you didn’t know to look for it, you would never know it is there. But a Four County Electric technician was awed by this spot, and so I decided to check it out myself. Awed by Ash’s As I drove down the dirt road off Holiday Rd., I continued to follow the red signs that appeared every so often as I was instructed. I weaved along the road until I saw a gated driveway. The gates were open so I turned in, anxious to reach my destination. The home of Four County EMC members Thomas and Nancy Ash appeared, tucked away in a beautiful and tranquil forest. As I stepped out of my car, I was dazed by the vibrant red, orange and yellow beauty of hundreds of Japanese Maple trees. The site in mid November, during the autumn peak for the leaves, was truly breathtaking. The Ash’s have raised approximately 5,000 Japanese Maple trees over the last 20 years on their nursery in Hampstead. The nursery showcases 60 different varieties which includes uprights, cutleafs (weeping or cascading), dwarfs (ideal for bonsai) and seedlings. There are also color choices unique to each variety including red, green and variegated. The Ash’s have been selling the trees to customers for about 16 years and for the past seven years Thomas has made caring for the nursery his full time job. Trees are priced anywhere from .50 cents for a seedling to over $1,000 depending on the size, age and layers of the tree. While in fall the trees boast vibrant red, orange and yellow colors, springtime exhibits blood reds and cool greens. The peak time for viewing spring colors is mid-March to early April. Each tree at the nursery is meticulously cared for on a daily basis. An impressive underground automatic water system keeps the trees moist while the trees are manually shaped, pruned and grafted as needed. 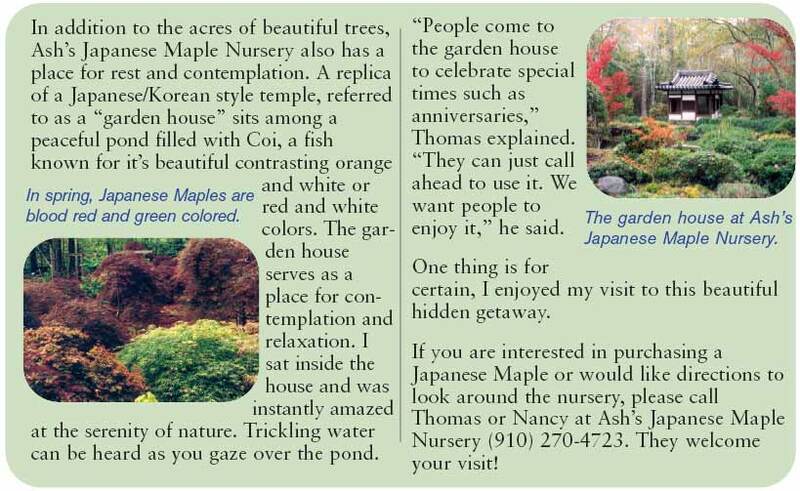 “Japanese Maple trees are manmade and every culture needs to be guided in order to maintain its unique shape,” explains Thomas. “Growing the trees is like doing a puzzle-you have the big picture in mind, you just have to put all the pieces together,” he adds. Grafting is one shaping techniques which involves taking a branch off of a cultivated tree and splicing it into the understock of a Japanese Maple, which creates a domelike effect. The higher the graft, the more domelike the tree will appear. Bonsai is another technique in which a tree is shaped, cut and tied with wire. The tree is then staked to grow in certain directions, which creates platforms. Platforms are what give bonsai trees their unique appearance. If you don’t know how to maintain the shape of your tree, Thomas gladly teaches his customers how to do it. If you don’t want to care for it yourself, he will prune your planted tree for you for a set fee. Thomas will also assist you in selecting the right tree for your yard. Spring is the best time for planting. Ash’s Japanese Maple Nursery is home to thousands of beautiful trees. The fall colors are pictured here. 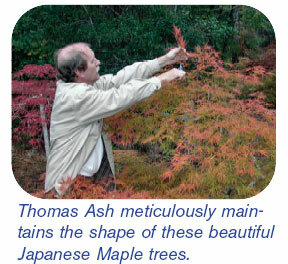 Thomas Ash meticulously maintains the shape of these beautiful Japanese Maple trees.